Shambo the "sacred" bullock has been taken for slaughter from a multi-faith community after police were drafted in to remove protesters. 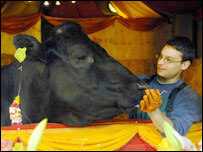 The Welsh Assembly Government said Shambo had to be destroyed after testing positive for bovine TB. 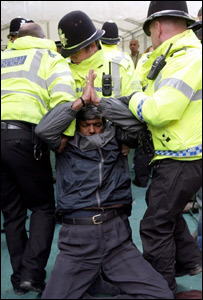 More than 100 people joined worship at Skanda Vale in Carmarthenshire to try to slow Shambo's removal. Earlier, officials were forced to obtain warrants to enter the site, then had to call police to clear the area. At around 1925 BST, government officials loaded Shambo onto a trailer and drove him away. The six-year-old Freisian, who is officially registered as Bullock UK 742266 200001, was expected to be taken to a local abattoir for a lethal injection. It ends a protracted legal battle which started when a TB test returned positive in April. The removal came after the community finally lost their High Court fight on Monday. Temple monks had originally been told Shambo would be moved at 0800 BST on Thursday, and they began their protest early outside a temple housing the bullock, isolated from other animals. Officials turned up to request entry to the site, but were refused as they did not have a warrant. Shortly after 1400 BST, they returned with two official warrants, but then immediately left the site after failing to gain access for a second time. At about 1600 BST, police used bolt cutters to get through the gate and move their vehicles - including an animal trailer and four riot vans - onto the site. More than 20 police officers then started leading or carrying away worshippers from their position directly outside Shambo's enclosure. Speaking after she had been moved, Christine Hough said there was no need to put Shambo down. "He is sacred to these people - he is not in the food chain," she said. After Shambo had been taken away, community leader Brother Alex said the group had done its duty. "We did everything we could to uphold the sanctity of life," he said. "Shambo was not a risk to anybody. To suggest he was a risk to other animals and other people is absolutely false." In a joint statement, the assembly government and Dyfed Powys Police said it had been "an extremely difficult operation for all concerned but handled efficiently and with great sensitivity by all agencies involved". "Despite a large number of people present, the animal was removed from the site without any injury to it or to people present." Earlier, an assembly government spokesman said officials had to wait to be denied access before they could obtain a warrant, adding its main concern was to "minimise distress as much as possible to the animal". The assembly government said it was aiming to protect human and animal health and appealed for co-operation, but the monks had warned officials they would have to interrupt worship to remove the animal. Supporters from as far afield as New Zealand and Switzerland took part in a pooja ceremony celebrating the sanctity of life at the temple enclosure. An online petition attracted 20,000 signatures and the bullock's supporters were able to keep up to date with events via a webcam, although the monks said the site crashed for a period on Thursday due to the number of visitors. But the monks faced opposition from many quarters, including the farming sector, where Shambo was seen as a disease risk to livestock. Brian Walters, vice-president of the Farmers' Union of Wales (FUW), said: "We have to follow the rules like everybody else and I won't say we don't have sympathy because the farmers who've lost cattle do sympathise." Last week, a High Court judge gave the community hope when he ruled that two slaughter orders for Shambo "were unlawful and will be quashed". But on Monday, his ruling was overturned by the appeal court in London.